Most of us acknowledge that the beer-commercial fantasy of beaches, babes and booze is just that  a fantasy  and move on. Not Richard Overton. In 1991, he sued Anheuser-Busch for $10,000, citing false and misleading advertising that allegedly caused emotional distress, mental injury and financial loss. Overton said the company's ads  which depicted beer's magical ability to facilitate "scenic tropical settings [and] beautiful women and men engaged in endless and unrestricted merriment"  turned out to be "untrue." The case was dismissed. Overton didn't back down, though. In a 2007 interview with the Kalamazoo Gazette, he took umbrage at his popular image as "a sexually frustrated guy who drinks Bud Light so he can find pretty girls." Overton is a teetotaler with three children by his wife of three decades. 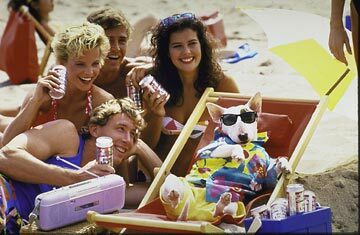 The spark for the suit, he said, was seeing his young kids captivated by Spuds MacKenzie, the dog depicted in Bud Light commercials. "I looked at them, and I thought, 'This isn't right,' " Overton said. "Here are my kids being drawn to part of the culture of alcohol because of this advertising. That's when I figured something needed to be done." Fair enough. But perhaps targeting the company's failure to turn boozy fantasies into reality was the wrong tactic.